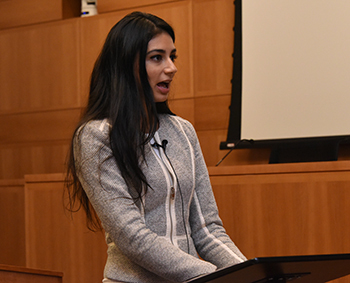 Students in Fordham Law’s inaugural Medical Malpractice Litigation Practicum concluded their class on May 2 with an exciting mock trial that featured doctors and residents from St. Barnabas Hospital Emergency Room in the Bronx as co-participants. Six Law School students acted as attorneys in the fictional medical malpractice trial, delivering opening and closing arguments before a jury of St. Barnabas residents, attending physicians, and medical students, and performing direct and cross examinations of actual St. Barnabas doctors, during the event held in the Gorman Moot Courtroom. 3L students Mariana L. Gallastegui, Rebecca Laitman, and Anthony Makarov served as plaintiff’s attorneys. Meanwhile, Rebecca Rosen, Parul Monga-Bhatia, and 2L Manpreet Monica Uppal represented the defendant, played by St. Barnabas Dr. Rikin Shah. The mock trial’s defendant, Dr. Rikin Shah, listens as Professor James Kainen, the trial’s judge, looks on. The medical malpractice mock trial, believed by its organizers to be the first of its kind, resulted from a year of planning and cooperation between the Law School and hospital. Dr. Mark A. Curato, assistant director of St. Barnabas’ Emergency Medicine Residency Program, invented a precise, high-fidelity medical record from scratch that allowed for good arguments on both sides, and the hospital supplied doctors for depositions and generated expert reports. The case involved a 57-year-old man who suffered a fatal heart attack 11 hours after being discharged from the emergency room with a diagnosis of anxiety. The plaintiff alleged the death was caused by the negligence of his emergency room doctor. Parul Monga-Bhatia gives defense’s opening argument. 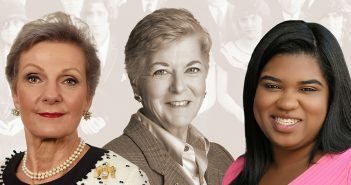 “What’s unique about this class is not only the participation of residents and teachers from St. Barnabas but the facts of the case—the witness statements and the depositions—were developed organically by the law students themselves,” said course instructor Adam Shlahet ’02, who also serves as director of Fordham’s Brendan Moore Trial Advocacy Center. The trial’s unscripted nature meant students had to think and react strategically, as they would in real life, Shlahet added. Curato conceived the seminar as a way to provide emergency residents an immersive experience that exposed them to medical malpractice litigation from the point where they are sued to a trial’s end. Likewise, the doctor observed that such a program would offer law students a level of medical authenticity their education previously lacked and, as such, contacted Fordham Law Professor James Kainen, the Brendan Moore Chair in Advocacy. Kainen served as the final mock trial’s judge. “We thought it would be a win-win, and that everybody could benefit if we donated our medical expertise to their legal education and they donated their legal expertise to our medical education,” Curato explained. Plaintiff’s attorney Anthony Makarov speaks as Adam Shlahet watches. 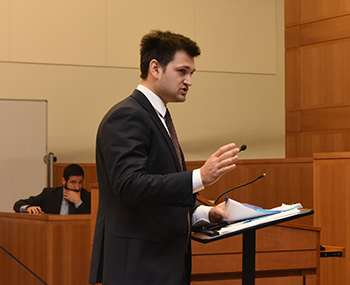 The mock case’s developments, such as Shah’s deposition, provided Curato an opportunity to discuss general steps of malpractice with his 40 residents during their weekly Wednesday morning academic conference. On the legal side, the seminar illustrated to students how a trial often hinges on, in addition to expert testimony and analyzing medical records, a jury deciding which side it believes most. After closing arguments, attorneys gathered around the jury box to listen to jurors recount which arguments worked and which didn’t. 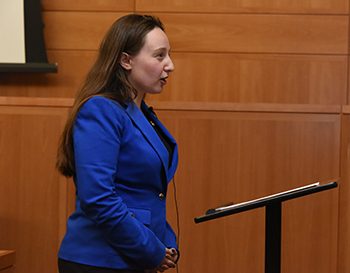 For 3L Rebecca Rosen, the class introduced aspects of medical malpractice litigation, trained her on interviewing witnesses and developing persuasive arguments, and provided opportunities to conquer her speech anxiety. During the mock trial, Rosen cross-examined the actress playing Mrs. Lucas, the wife of the deceased Gene Lucas, and questioned the defendant Dr. Shah. Prior to taking the stand, the doctor shared with Rosen that he felt nervous—an admission that helped distract the aspiring attorney from her own apprehension about speaking before the room and focus on the points the doctor needed to convey to the jury. Rebecca Rosen cross-examines plaintiff as Dr. Mark Curato looks on. Rebecca Laitman delivers plaintiff’s closing argument. Fellow 3L Mariana L. Gallastegui agreed with Rosen’s assessment of the class’ import. Gallastegui delivered the plaintiff’s opening statement and cross-examined the defense’s expert witness, Dr. Daniel Murphy, chair of St. Barnabas’ Department of Emergency Medicine. In the course of the mock trial, Gallastegui, a member of Fordham’s Brendan Moore Trial Advocates, experienced two firsts: speaking before a jury of her peers (as opposed to a competition evaluator) and questioning a medical expert who has previously testified in court. Anticipating the demands of a changing legal profession is one of the six objectives of the Law School’s strategic plan, Fordham Law Forward.